This is a sponsored post written by me on behalf of E*TRADE for IZEA. All opinions are 100% mine. Tax efficiency is critical if you want to maximize your returns. Due to the complexities of both investing and U.S. tax laws, many investors don’t understand how to manage their portfolio to minimize their tax burden. Before investors can take any steps toward tax-efficient investing, they must first determine how their accounts are structured under the law. Generally speaking, accounts can be taxable, tax deferred or tax exempt. For taxable accounts, investors must pay taxes on their investment income in the year it was received. A recent E*TRADE Streetwise survey of experienced investors revealed that while many investors are tax conscious, most aren’t using all the tools available to them to limit the amount of taxes they pay each year on investments. With tax season in full swing and tax day just around the corner, E*TRADE explored investor behavior when it comes to taxes and offers tools available to manage taxes now and in the future. When it comes to investing for the long haul, it’s always important to consider taxes, as the capital gains minus taxes can be significant. Are you a DIY investor who wants to take some control of their finances? The E*TRADE Education Center offers a number of easy-to-use tools and resources to help traders and investors alike better understand and manage their taxes. 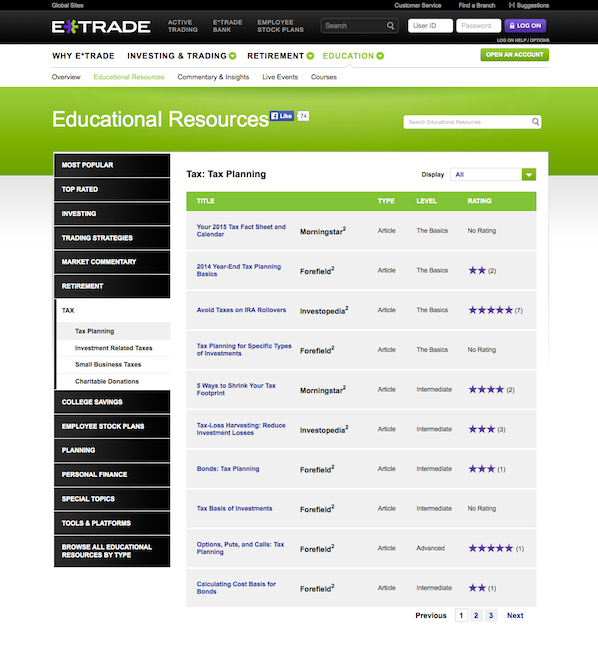 E*TRADE Education Center also offers a host of educational resources that are available to all investors regardless of if you are a customer or not. You don’t even need a log in. 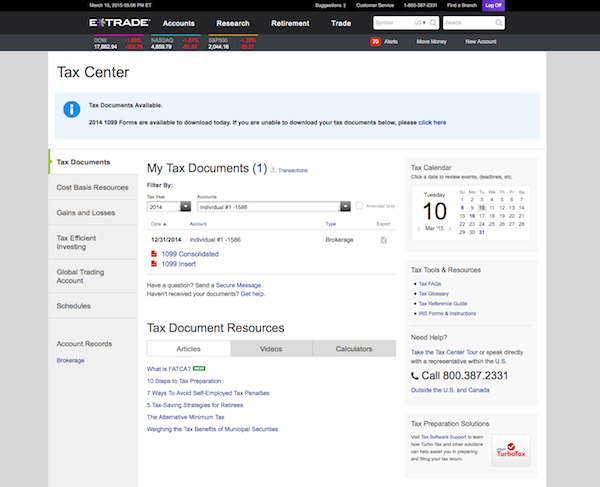 E*TRADE also has a Tax Center, which provides an array of tools and resources for customers, all in one place, including important information on everything from cost basis reporting and tips on managing capital gains and losses, to frequently asked tax questions. Whether they know it or not, most people are already doing tax-advantaged investing through their 401(k), which is great. However, even more tax-advantaged investing can be done through a Roth IRA (which uses after-tax dollars, plus earnings are tax free if withdrawn after you’re 59 and 1/2). These special accounts allow you to enjoy either tax-deferred or tax-free growth of your investments. The E*TRADE StreetWise survey also revealed that investors understand the benefits of tax-advantaged accounts, such as IRAs, 401(k)s, 403(b)s and Health Savings Accounts (HSAs). In fact, 45 percent of all investors believe investing in these accounts is the most effective strategy for limiting taxes they pay on investments each year. Additionally, half of all trading takes place in tax advantaged accounts, such as IRAs. That number is even higher for younger investors, with nearly 60% of all their trading activity happening through their IRAs. If you max out every one of these accounts, you will have saved more than the GDP of some countries. People will be talking about you at parties. 🙂 Ahead of Tax Day, you can look to your online broker as a resource to learn more about investing in a tax-efficient way, with tools that are usually available to ALL investors whether they are customers or not. Keep in mind like any part of investing, one should not invest solely for tax avoidance. Do not miss investment opportunities just because it’s tax inefficient, though it should always be considered with your planning. As your various investment accounts grow in dollars, you’ll be able to put new investments in the most tax efficient account. I Won a Structured Settlement. Now What? Credit Card or Debit Card: Which is Better?